Limited Edition Deluxe 180g 4LP, 6CD, DVD & Book Box Set! This Limited Edition Deluxe Edition Box Set includes the 2016 remastered original album Ride the Lightning on 180-gram LP and CD, live and previously unreleased material across vinyl and CDs, a Picture Disc EP, plus a DVD featuring live performances and interviews. In addition to the music, the box set includes a 64-page book featuring new essays, never-before-seen photos, ticket stubs, tracking sheets, and more. There is also a mini-book with handwritten lyrics, and a set of three posters from their 1984 European tour. Released in 1984, Metallica's second album, Ride the Lightning, is considered by some to be their best. The album contains "Fade To Black," "For Whom The Bell Tolls" and concert favorite "Creeping Death." Ride the Lightning is often hailed by fans as a classic of the thrash metal genre, and a vital bridge between the band's albums Kill 'Em All and Master of Puppets, pushing the thrash metal of the debut into progressive territory more fully-realized on Master of Puppets and ...And Justice for All. The album retains the speed of Kill 'Em All on songs such as "Trapped Under Ice" and "Fight Fire with Fire," but also contains the first of Metallica's longer, more symphonically arranged tracks, such as "Fade to Black" and the nearly 9-minute closing instrumental "The Call of Ktulu." Ride the Lightning was listed at No. 3 on a list compiled by metal-rules.com of the Top 100 Metal Albums of All Time and No. 5 by IGN Music on the Top 25 Metal Albums. Decibel Magazine rated it the No. 1 thrash metal album of all time. The deluxe box set includes original source material from the band's personal collection with many never before heard or seen recordings along with books including rare photos and essays from those who were there. 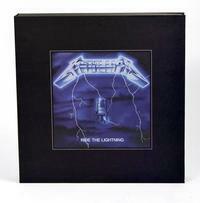 The deluxe numbered box set of Kill ‘Em All includes four vinyl records, five CDs, one DVD, a hardcover book including rare photos and a patch while the deluxe numbered box set of Ride the Lightning includes four vinyl records, six CDs, one DVD, a hardcover book including more of those unseen photos, a mini-book of lyrics handwritten by James Hetfield and a set of three posters. The deluxe box sets are limited edition collectors' items, so get yours before they are gone!